Note: Since this story ran in the Spring of 2007, Ex Libris and Epiphanies, both in Denison, have gone out of business. Under the assault of national chains, big box retailers, and Internet discounters, local bookshops in many parts of the country are closing their doors and saying goodbye to devoted customers. In Denison and Sherman, three local bookstores, Epiphanies, Ex Libris, and The Book Rack have bucked the trend and kept their doors open, and Texoma bibliophiles are glad for it. These three understand that readers need something more than mass-market selections and rock bottom prices. Epiphanies smells of musty old paper and the slowly aging glue of bindings. It is an aroma that is fine perfume to book lovers. 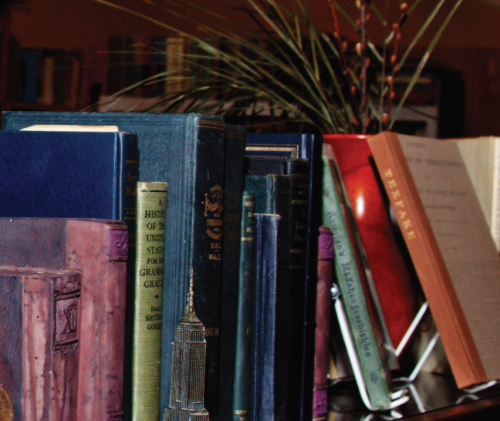 The store is a trove of old books—literature great and not so great, rare and not so rare. Good used bookstores are crowded places, and in really good stores the visitor all but needs a guide. At Epiphanies, owner Karen Jones is glad to take on that duty. She is quick to show you around the crowded bookstore, giving a general tour of the landscape. There is a little bit of everything, but the collection of antique books and nostalgia dominates the environment. In 1993, Jones was in college studying psychology when she realized it was not for her. She had a dream one night about a bookstore named Epiphanies. The next morning she turned the dream into action and started building a business. She sold her first book on her birthday. The store has changed locations three times, as Epiphanies keeps acquiring books and keeps running out of space, and the current location is the third stop since the store first opened in the Katy Depot. Jones and partner, Louis Ray, are continuing to expand the store, particularly the Internet part of the business, and they even have a few employees now who help run the place. “It’s great! Everybody works for books,” Jones said. Down the street is Ex Libris Books. This shop is a mystery lover’s dream, with rows of thrillers and crime novels, as well as a “whodunit” inspired atmosphere. The store has an air of a well-appointed library in a country house, with vintage pipes, imported cigars, and Carol Brownlee’s Gyotaku artwork. Stephen Walker, the proprietor of this establishment, debated opening a bookstore in the Dallas area, but the up-and-coming Denison Main Street captured his notice. He, along with his dog Moses, found a corner shop with an adjoining apartment, and that was that. Walker is thinking about more than just books, too. He has a plan for a murder mystery cocktail party where the guests are invited to participate and solve the crime. 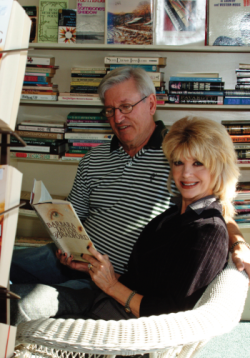 Bill and Kay Estes have operated The Book Rack for the past 28 years. The shop survived the summer floods. The Book Rack in the Westwood Village Shopping Center in Sherman, is the veteran of the three stores. In business for 28 years, Bill and Kay Estes have kept their customers coming back with a personal touch and knack for finding just about anything that was ever in print. The Book Rack’s niche is a huge selection of paperback fiction, from romance to men’s action to westerns, to science fiction, all shelved by genre, and even subgenre., and all very affordably priced. The bookshop started in downtown Sherman in a small shop. Bill worked as a high school biology teacher and coach while Kay ran the shop and raised their family. After fifteen years, they decided they needed more space and moved to their current location. Bill retired from teaching, and now they run the store together. With their long and successful run as independent booksellers, Bill and Kay often put their experience to use mentoring startup independents in Texas, Oklahoma and Arkansas. Bill says he does it because someone helped them to realize their dream of their own independent bookshop. Just a reminder, with cold weather around the corner, stray and unwanted dogs and cats will be looking for shelter and food. Why not give one a home? In return, you get unconditional love and the possibility of a lifelong friend. Both of my dogs are rescues and each has become a loving companion that brings joy to my life— sans their run ins with skunks this summer.